One of my favourite spring flowers, the Wood Anemone, introduced to the garden a few years ago, is well out now. 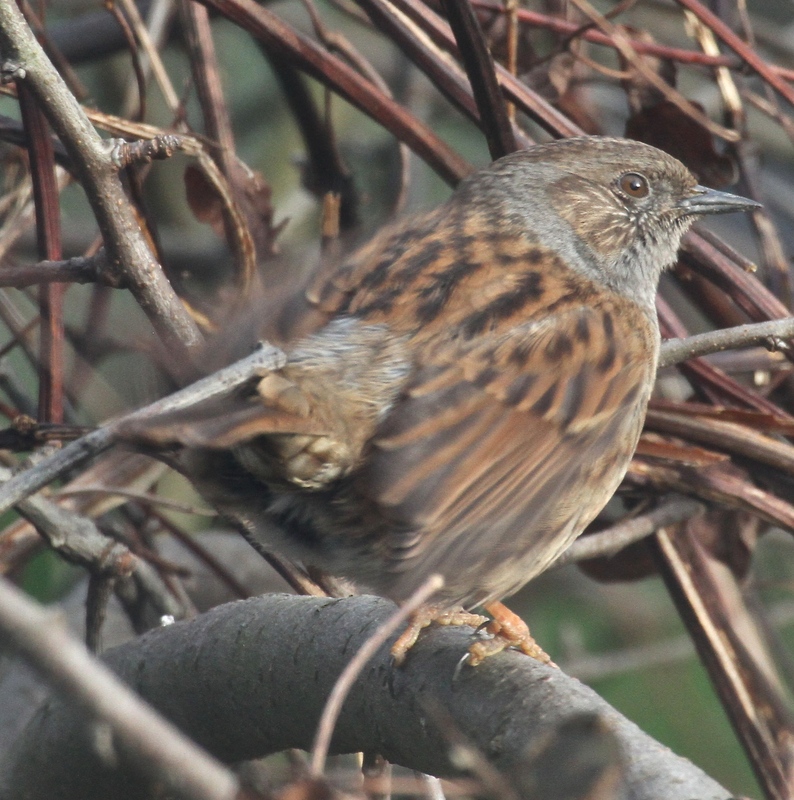 In the wild they are an indicator species for ancient woodland but sadly they are getting less common as less woodland is being managed as coppice. As well as their beautiful white flowers, sometimes with lilac tints, they are a good early food source for many insects, especially hoverflies which in turn are so good at eating aphids. 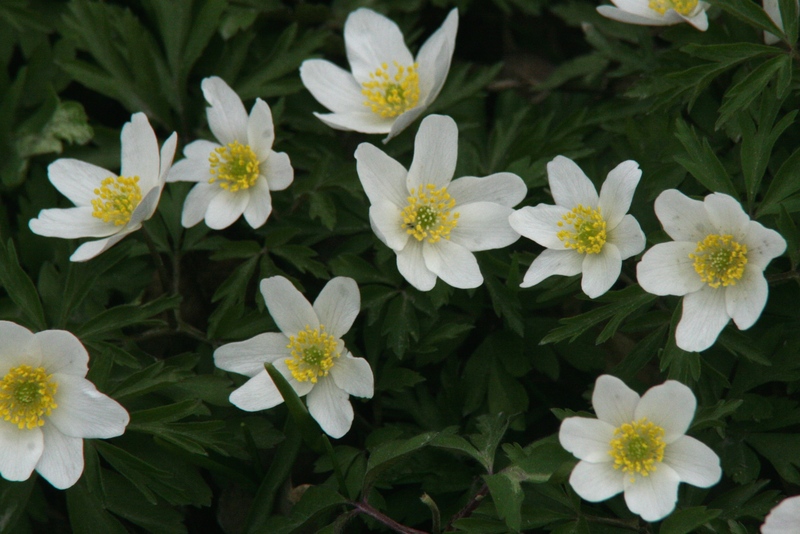 Wood Anemones spread by underground rhizomes so once you have a few you can easily dig up some roots and transplant them into a shady, damp part of the garden, even in the shade of buildings. 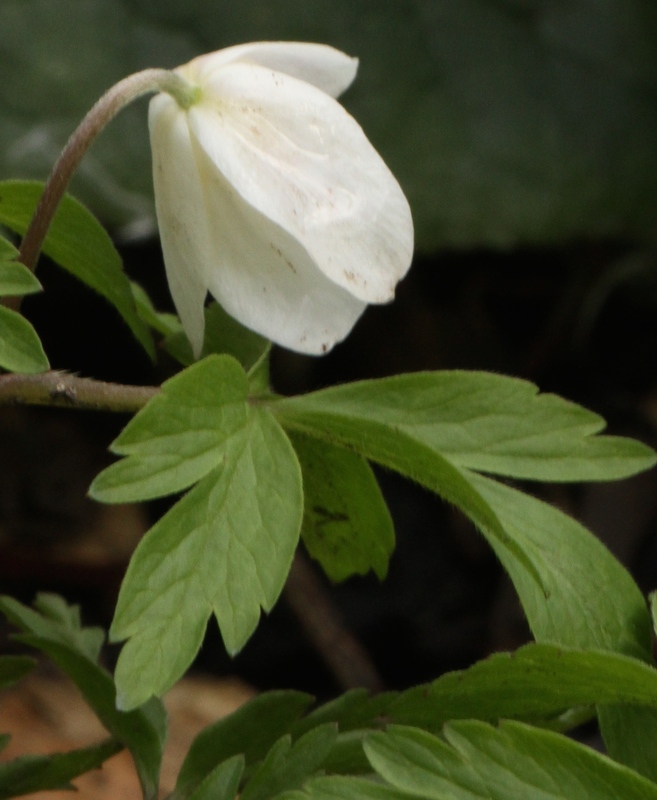 Wood Anemones are also known as ‘Moonflower’ and ‘Smell-fox’ (because the leaves smell musky, apparently!). They hang their heads in dull weather, only to straighten their stems and face skyward like hundreds of stars, when the weather brightens. The flower segments are tepals, not petals and vary in number from 6-8 or, rarely, up to 10. Wood Anemone, head hanging down in dull weather. Wood Anemones, face up to the sun, above the dark green leaves. Some with 6 and some 7 tepals. 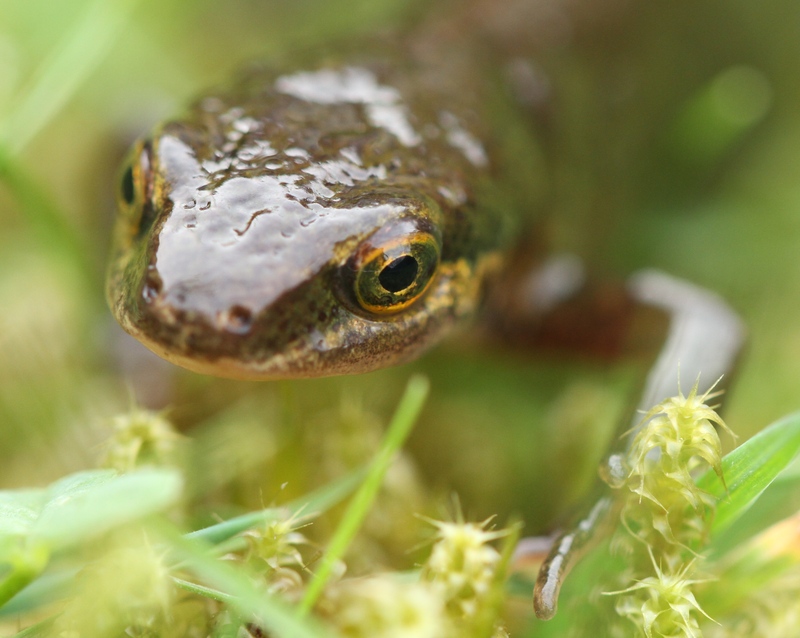 Smooth Newt, showing it’s dark spots and yellow/orange belly. 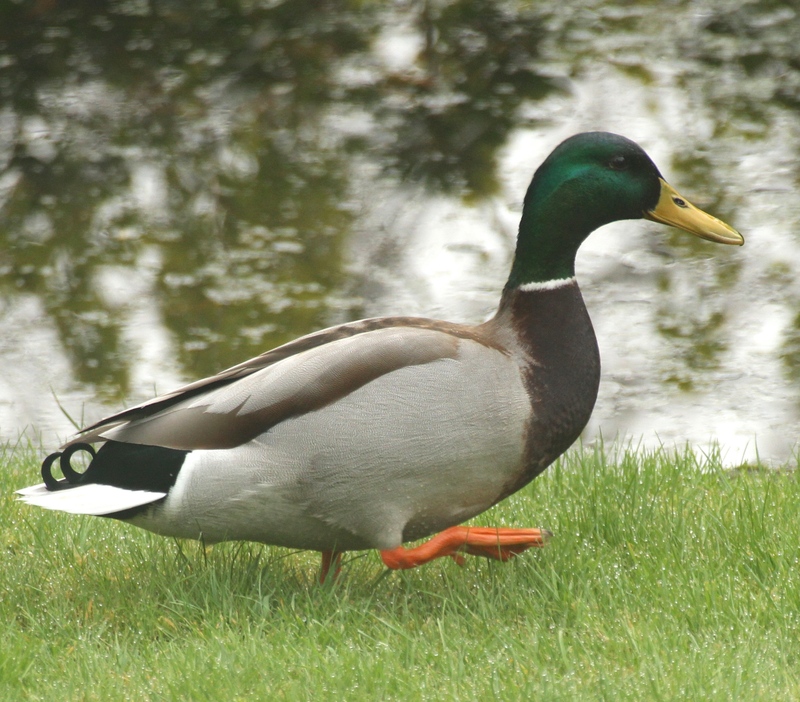 The most widespread duck in the world is the Mallard, which probably explains why we even get them occasionally on our tiny ponds in the garden. Today a pair of these dabbling ducks spent ages on our neighbours pond and grass. One reason for the Mallard’s success is it’s flexible feeding habits- they can eat invertebrates, worms, tubers, roots, plants and seeds. 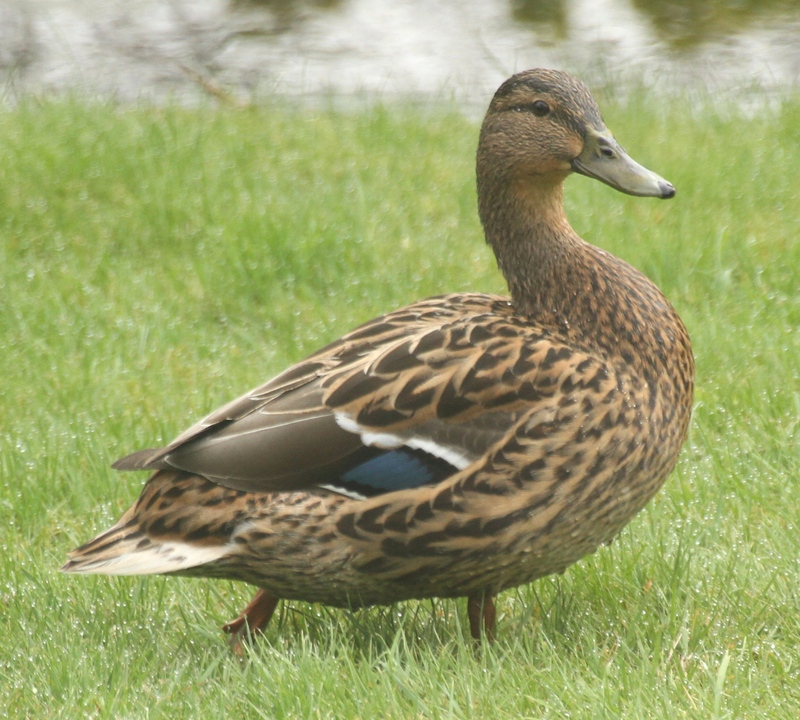 Mallard form pairs as early as October or November and stay together until the females begin to lay their eggs, when the males go off together and live in a ‘men’s group’, leaving the females to bring up the young. 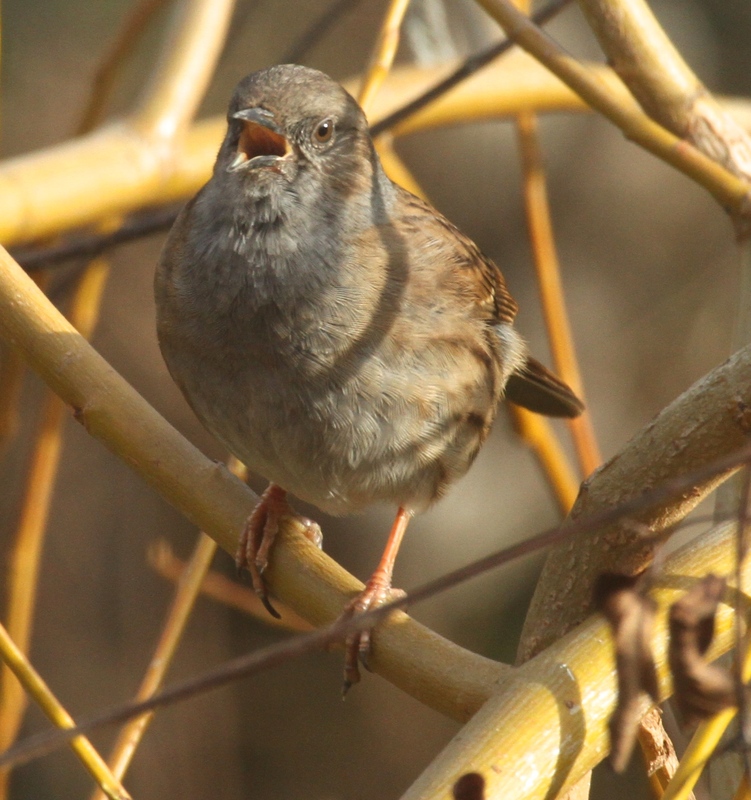 Nesting time is stressful for the female because she lays more than half her body weight in eggs! The nesting place is away from ground-predators, often up high. Chicks can swim as soon as they are born, and if you’re lucky you may see the big broods dropping several feel from a nest in a tree or bank, without coming to harm. 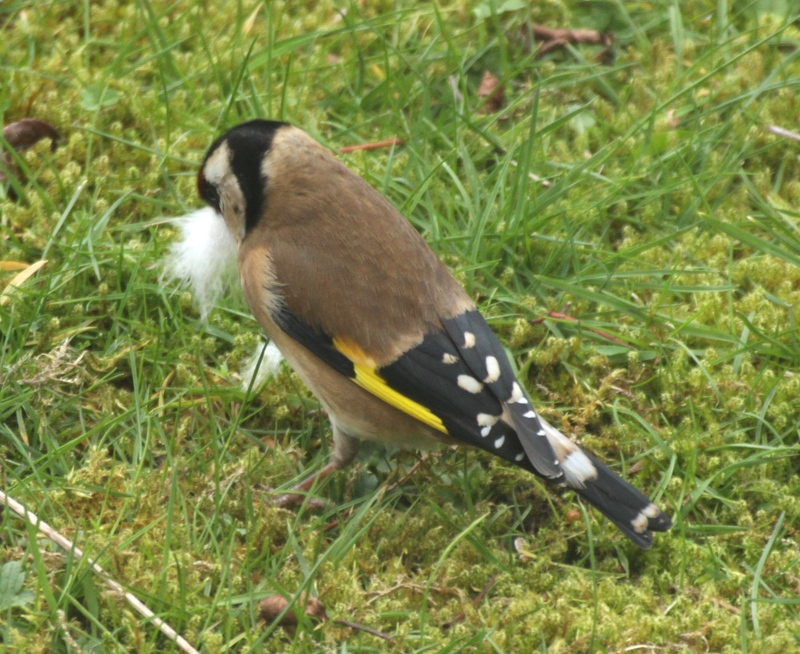 Female Goldfinch, showing the beautiful black and white wing-markings. 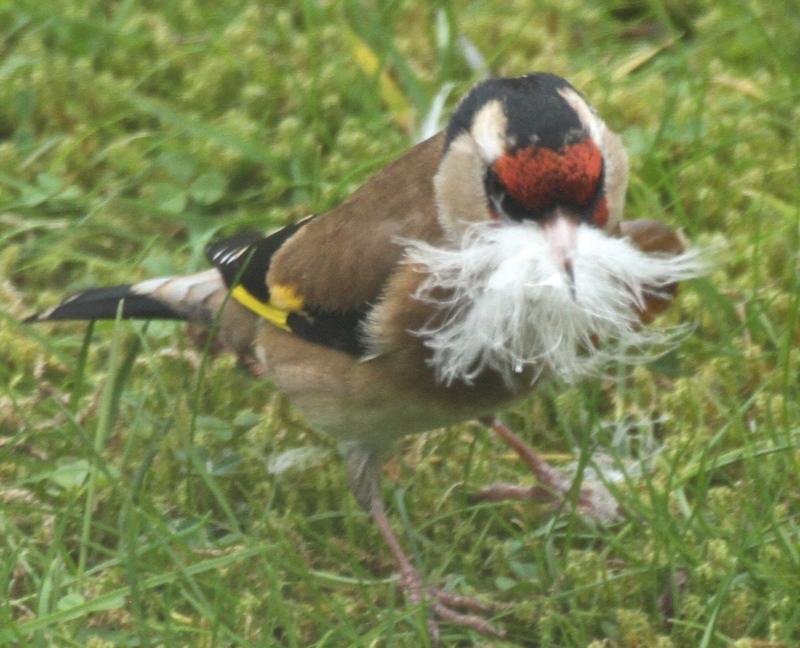 Female Goldfinch gathering a beak-full of down. A House Fly is not most people’s favourite spring sighting, but they are fascinating, and are one of the most widespread insects in the World. 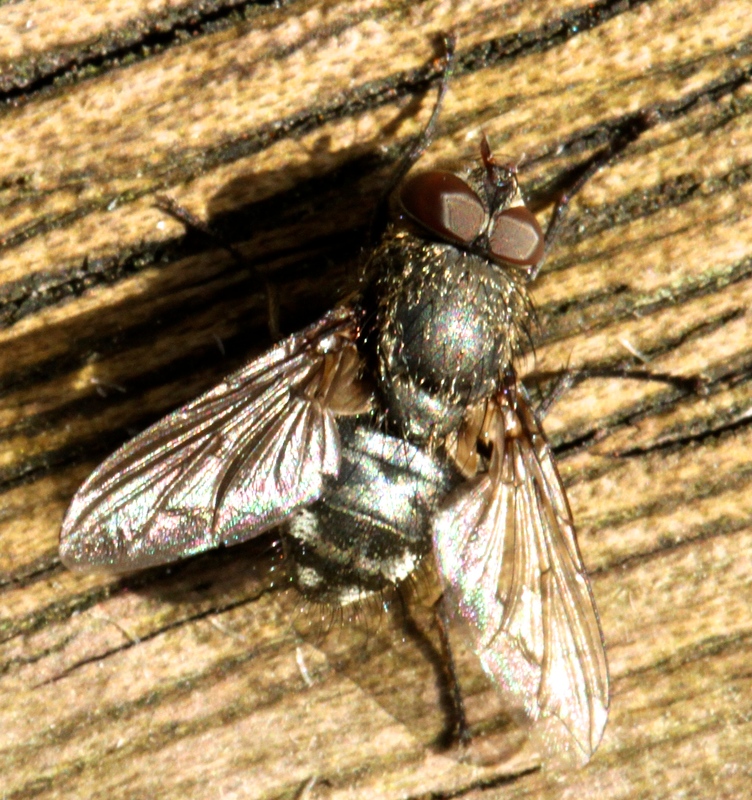 House Flies are Diptera– two winged- their second pair being reduced to stabilisers behind the pair of functioning wings. 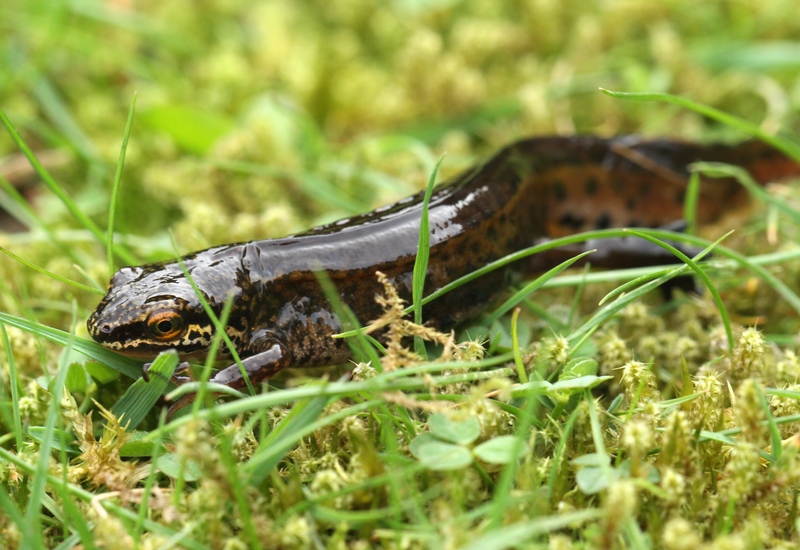 They can carry up to 100 different diseases and reproduce really fast in ideal conditions. 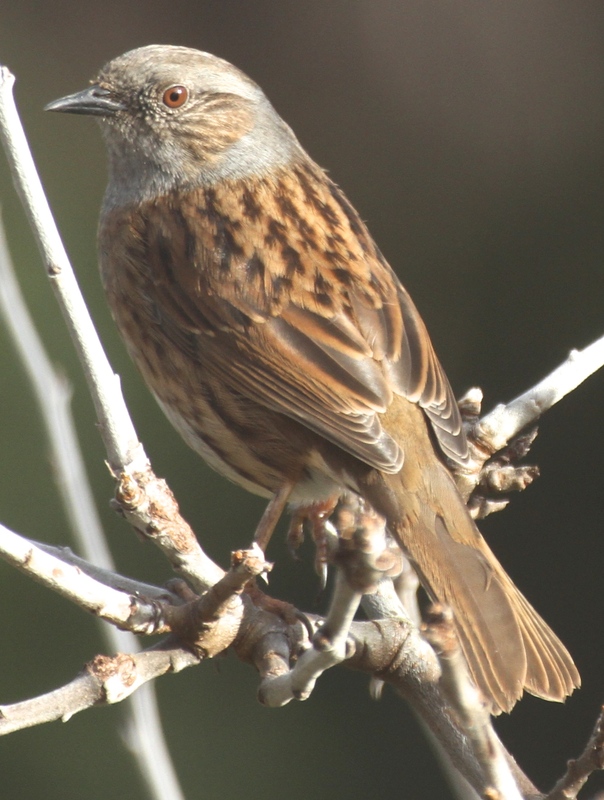 In fact scientists (those with too much time on their hands one presumes) have calculated that if a pair of house flies started laying eggs in perfect conditions in April, and all their offspring and subsequent offspring survived, they would have been responsible for the birth of 191,010,000,000,000,000,000 flies by August (a number I don’t even know how to say). Fortunately, they don’t all survive! 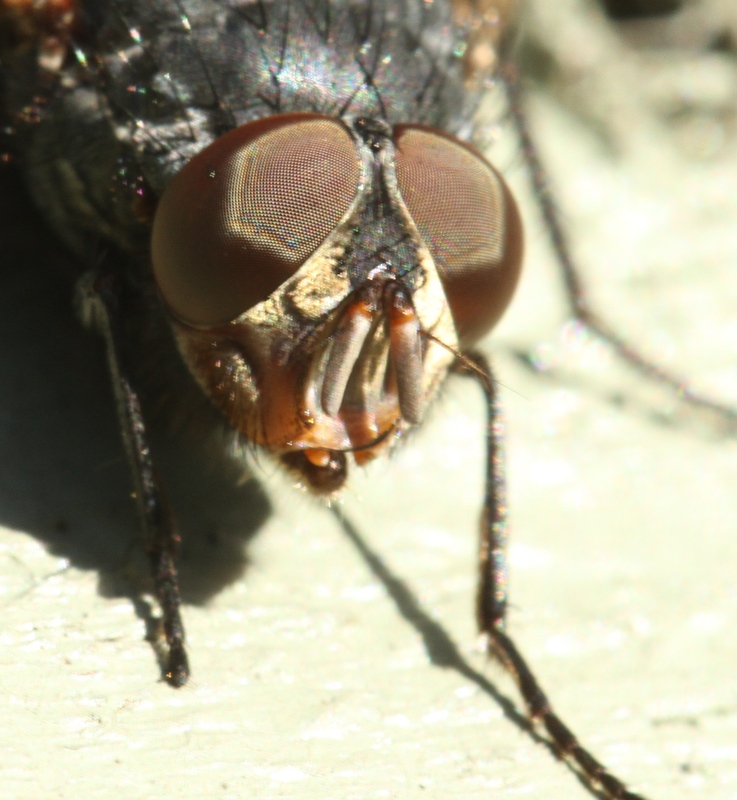 One of the special things about House Flies is their eyes, which are compound organs made upon thousands of individual lenses, able to see polarised light and parts of the colour spectrum we can’t see. They can detect the slightest movement in a very wide field of vision- which is why they are so hard to swat! Conditions: Cold northerly breeze, heavy rain showers and cloud. Temperature: Max 8- Min 5c. Some flowers, like these lovely Violas, have very obvious ‘nectar-guides’ or ‘pollen-guides’ to help bees and insects make a bee-line to their nectar. The lines act like markings on a landing strip, indicating the path to the nectar. Having tempted the insects to the centre of the flower, the insects get covered with strategically placed pollen and generally carry that pollen onto another flower of the same species. The insects get energy and essential water from the nectar, and the plant gets to reproduce. Flowers can also use scent and colour to attract pollinators. However, insects see the blue end of the colour spectrum better than us, and see ultra violet light we can’t see, and many flowers reveal nectar guides to bees and insects when appearing single-coloured to us. 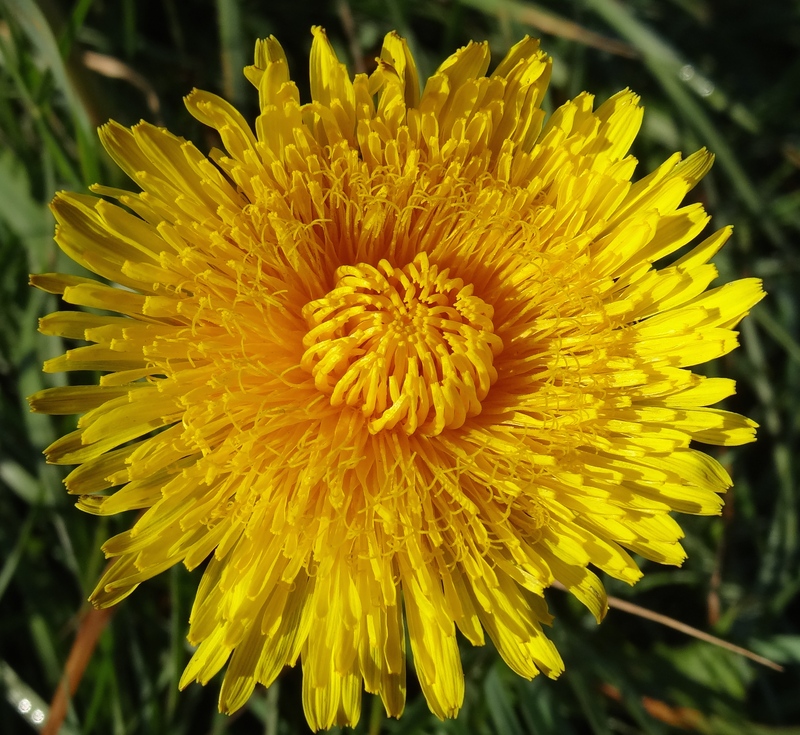 Examples include many yellow flowers, like dandelions and sunflowers. Nectar Guides on a garden Viola. Cultivated Viola with Nectar Guides visible. Dandelion, now out, have nectar guides invisible to humans.